Amanda trained at the Helma Institute of Massage Therapy, Sonoma College, and at Five Star Resorts in Napa and Sonoma. She believes that massage plays an important role in health and in life. She is interested in healing others while following her intuition. 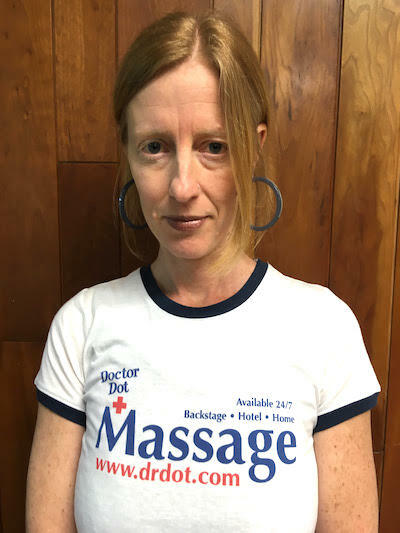 Amanda’s training and experience has given her the ability to assess the needs of each client, target the specific muscle or target group, increase mobility, and release pain and toxins from your body. She uses long, flowing, rhythmic strokes, cross fiber friction, and opening stretches to give you a deeply healing experience. Yared Dibaba Tour manager Tom C.
Casting Crowns Tour manager Melanie H.
Rod Stewart Tour Manager Matt O.
Hans Zimmer Production Manager David M.
Three Dog Night TM Tom H.